Pictured: Phil Wilson with his father Jeff Wilson, CEO of Extreme Engineering. 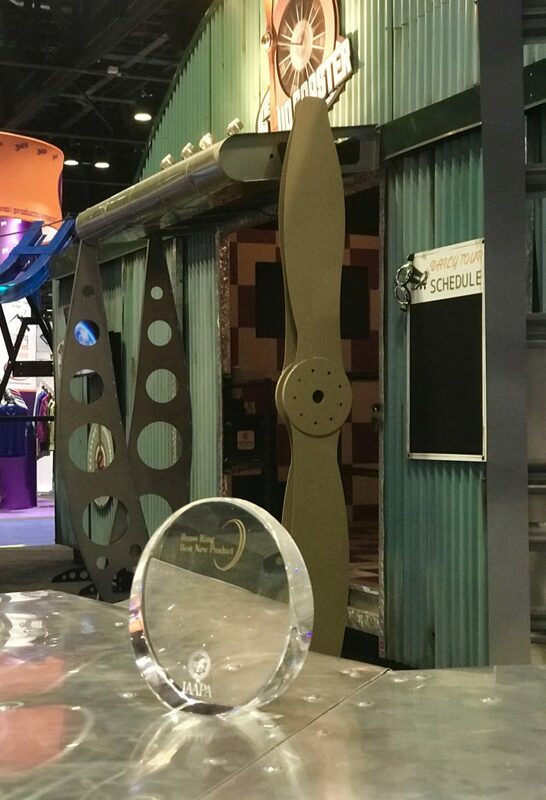 Sacramento, CA (January, 2018) – Last year’s IAAPA (International Association of Amusement Parks and Attractions) held in Orlando, Florida, marked another breakthrough show for Extreme Engineering. 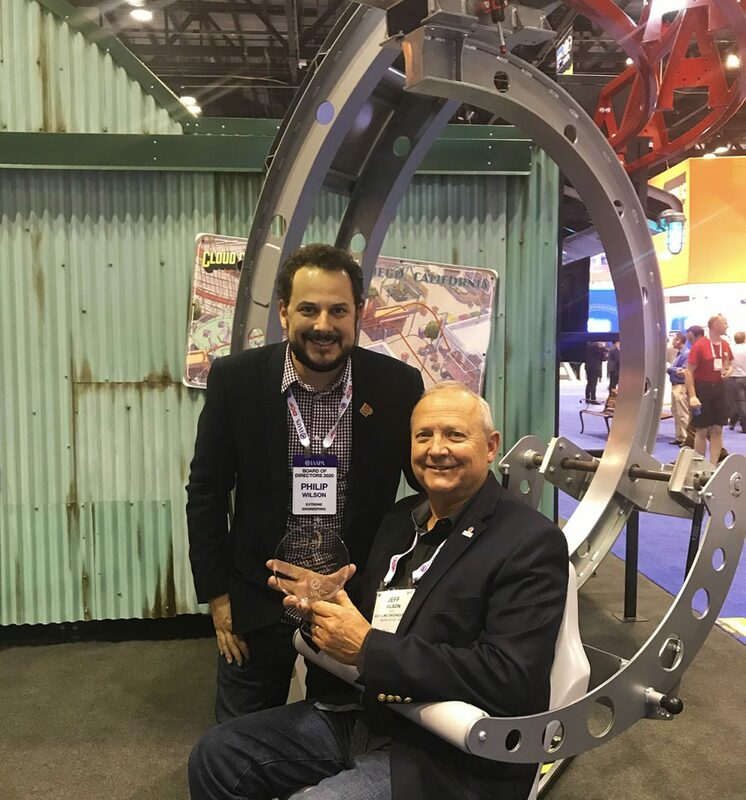 Extreme Engineering’s already two-time award winning roller coaster, the Cloud Coaster, earned its 11th industry award, “Best Major Attraction Under $3M,” on the latest roller coaster design. 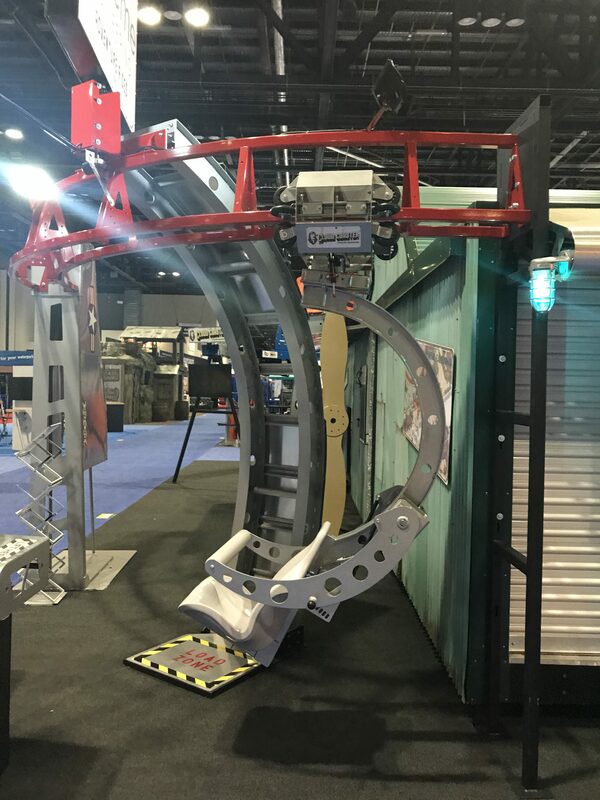 The suspended coaster, debuted back in 2015 at IAAPA’s trade show, has gained notoriety and awards ever since (including recognition by USA today as a top new attraction). The Cloud Coaster has multiple installations with three in operation. Several Cloud Coasters are projected to be in operation by Summer of 2018 with more to follow by the end of this year. Pictured: IAAPA Officers, including IAAPA President Paul Noland, and the executive team of Mega Parc. Extreme Engineering’s largest roller coaster project to date is expected to open this fall at Mega Parc, an indoor “steampunk” theme park, located in Quebec, Canada. “We are designing the very first family-friendly coaster to go through a Ferris Wheel in North America and are the second in the entire world to do this type of configuration,” states Matt Rehnstrom, Vice President of Sales with Extreme Engineering. The roller coaster is anticipated to debut a new cart system, experiencing speeds up to 25-30 miles per hour. “This is the latest in a scalable, cost-effective roller coaster and no other attraction can offer this one-of-a-kind experience. You are completely free in space…the best way to explain this sensation is that feeling you get when you are dreaming of flying,” explains Phil Wilson, Executive Vice President with Extreme Engineering. Pictured: Extreme Engineering’s debut of the new Cloud Coaster’s cart at IAAPA 2017. Some of the patent pending features allow the roller coaster to provide a thrilling experience like no other attraction on the market. Using low-voltage motors, lifts, a state of the art magnetic braking device and a cart design like no other, the Cloud Coaster is a true technological marvel. “We are very proud of the Cloud Coaster’s accomplishments and also the design breakthroughs we have introduced to the industry. This engineering project was like nothing else ever produced and the results have been truly remarkable,” states Jeff Wilson, CEO with Extreme Engineering. 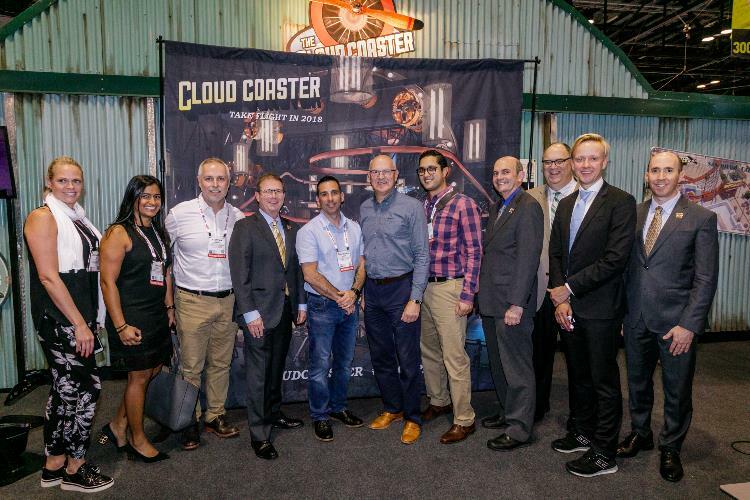 The Cloud Coaster is reclassifying family-friendly attractions, providing the only award winning suspended coaster under $3M to the industry. This year marks the official amusement association’s 100th year anniversary with the slogan, “Fun Forward. Build the Future.” With record growth over $40 billion dollars to the global attractions industry and over 5,000 global members and counting, IAAPA is the premier association to the amusement industry. “2018 is about growth, opportunities and emerging markets, all of which we are experiencing firsthand,” says Wilson.